It's been a good year for really huge aperture sizes on camera lenses, with products like the Sigma 18-35mm f/1.8, and the Metabones Speed Boosters. 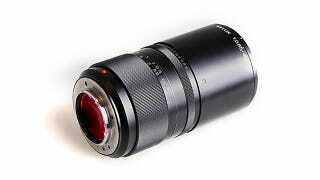 But next year you'll be able to get your hands on a 40mm lens with an aperture size of f/0.85. That is one gaping piehole. The Ibelux 40mm f/0.85 comes from Kipon, a lesser-known maker of photographic accessories. It will drop in February 2014 and be available for Sony NEX, Fuji X, Canon EOS M and Micro 4/3 mounts. It doesn't look like it will cover full-frame sensors, however. The price is a whopping $2000. 43rumors.com points out that there is actually a Leica 65mm lens that features a f/0.75 aperture, so the Ibelux's "fastest lens in the world" claim isn't completely accurate. It's still damn impressive though.